I acquired an early fascination for ghost and horror stories, a delight to read, a greater delight to thrill. I loved reading tales that heightened my senses, tales that amplified every little creak, every unsettling noise made by settlement, by the night and by the wind. At school after lights out I used to read aloud by torchlight to the other girls in my dormitory, all sharing a shivery thrill. But when I became an adult I put aside childish things and imagined fears. I still love Gothic fiction, the stories of people like M R James or Sheridan Le Fanu, but they have lost the visceral power they possessed on first acquaintance. I’m an adult now; fiction no longer has the same scary energy. Well, that’s not entirely true. There is a genre of neo-gothic in which I have recaptured something of the fascination and thrill of fear. I can think of two novels in particular that caught past moods, that challenged me on the simple level of instinct, that place where rationality gives way to more atavistic emotions. There is Thomas Harris’ Silence of the Lambs and Stephen King’s Gerald’s Game, both of which terrified me into the old ‘only a story’ frame of mind. Now they have been joined by a third – Apostle Rising by Richard Godwin. I had no previous acquaintance with the work of Godwin, a writer, I’ve since discovered, of short stories. This is his first novel, a detective story that is so much more than a detective story. Normally I’m not that sympathetic to the crime genre, having quickly read and just as quickly forgotten some of the Rebus stories of Ian Rankin. 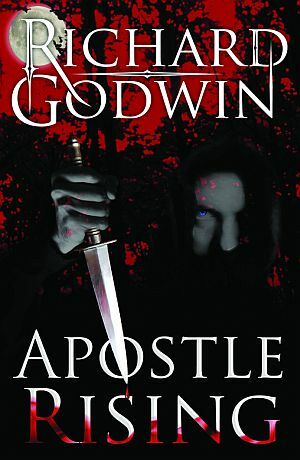 But Apostle Rising gripped me from beginning to end with its imaginative plotting and clever writing. I try hard to avoid clichés and hyperbole but this book is a tour de force, subtle and horrifying at the same time. It’s a story of evil. It’s a story of two detectives, Chief Inspector Frank Castle and Detective Inspector Jacki Stone, and their encounter with evil, their encounter with its insidious power, which takes the former in particular to the gate of self-destruction. It’s the story of a cult, of religious mania, of copycat killings, of parallel murders, politicians at the top of the tree and prostitutes at the bottom. I can’t be sure if this was in the author’s mind but the killings, often carried out in tandem, had overtones of the Manson family and Helter-skelter and the earlier Whitechapel Murders of Jack the Ripper. Some of the details, the horror of the crimes, are so vivid, so graphic in description that I found myself skipping before my imagination went into overdrive! 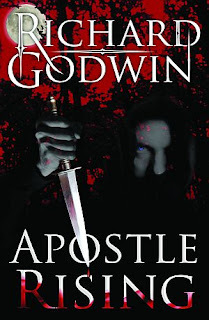 Godwin has a compelling style, lucid, limpid to a superb degree, prose at its purest. Most of the chapters are short, sometimes no more than a page or so, with hooks that pull one forward. Those passages in italics, which reveal the workings of the killer’s mind, full of apocalyptic, manic and semi-poetic meanderings, make for incredible reading. There are all sorts of unusual twists and turns. I was particularly intrigued by the references to Sir Thomas Wyatt, Anne Boleyn, Henry VIII, Richmond Park and hunting. If you want to find out anymore you will just have to read it yourself! Apostle Rising is a book full of memorable characters and memorable incidents, a well-crafted puzzle in what I see as the best tradition of gothic fiction. It carried me along simply by its own momentum, by the way it’s shaped and by the clarity of the writing. The only criticisms I have are on minor points of detail. It thought that some of the police work was not as careful as it might have been, particularly in relation to the final political victims. The last one should have been under closer observation, given his connections with the penultimate victim. Also I was surprised by the way in which Karl Black, the villain-in-chief, a wholly malevolent individual, the novel’s Hannibal Lector, was finally pinned down by the confession, offstage, of his principal collaborator, Jonas Wilkes, who had hitherto shown no sign of co-operating with the police. No explanation for his change of mind is offered. This is minor stuff, though, and if you think I’ve given the game away by naming names think again; this book will keep you guessing to the end and beyond. And just pray that you never meet Blade. Have you inadvertently transposed politicians and prostitutes? No, Anthony. I've rephrased it slightly to make the point clearer. I don't like the horror genre, with the possible exception of the plainly camp and ludicrous Hammer variety. For me the true horror in such fiction is that evil described, though fictional in a particular instance, in similar form actually exists in the real world. I also worry about the specific nature of the pleasure some horror connoisseurs derive from this material. The worst kinds of sadistic psychopaths are often found, subsequently, to have a stash of horror fiction, although to be fair it's usually in the form of video. Certainly the examination of the perverse motivations of warped inhuman minds is fascinating, if disturbing. However, most horror fiction seems reminiscent of the pornographic and salacious reporting in downmarket newspapers of brutal crimes, consumed with what appears to be macabre and ghoulish relish by their readers, depressing, low and depraved, like those who enjoy perpetually unfolding misery of popular soap operas. Like you I don't scare easy and the book doesn't -- really -- go out of it's way to jump from behind the curtains and go: BOO! Still, there are a couple of scenes that made me stop reading (late at night and by myself, of course)and go check that the windows and doors were all properly locked. A remarkable first novel. A1eXe1, thank you very much for your thoughtful contribution. One either finds this sort of thing compelling or one does not. As I say, I like horror fiction, perhaps for some of the not very noble reasons that you allude to. However, I do draw a strong distinction between the gothic imagination and the depressing mediocrity of so much ordinary crime. I derive no vicarious pleasure at all from real suffering. Aj, yes, it is, a well-crafted and gripping tale. Bob Shane Stevens is a remarkable writer. No one knows who Shane Stevens is, there is an limited amount of background on him and he has written some great novels.